The U-10 multiparameter water quality meter brings laboratory accuracy and the ease of push-button operation to water quality measurement in the field. Six parameters can be measured : pH, temperature, dissolved oxygen, electrolytic conductivity, turbidity, and, salinity. Featuring a powerful sensor and state-of-the-art functions, the multiparameter water quality meter makes it easy to get highly reliable water quality data simply and quickly just by submersing the sensor in the water. The multiparemeter water quality meter is flexible enough to use for checking the quality of a broad range of water samples, from factory effluent to urban drainage, river water, lake and marsh water, aquatic culture tanks, agricultral water supplies, and sea water. The main unit is water resistant, so it can be used safely even in the rain. 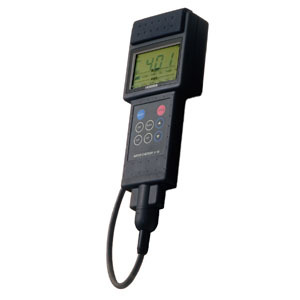 The U-10 multiparameter water quality meter has an automatic calibration function that calibrates the instrument simply at the touch of a button for more highly reliable data. What used to be a complicated calibration process is now easy. Just fill the supplied beaker with the standard solution, immerse the sensor and press a button once for one-point calibration for each of the four parameters pH, conductivity, turbidity and DO. Two-point calibration is also possible should more precise data be required. The U-10 multiparameter water quality meter has an automatic salinity function that makes it possible to measure DO in both fresh water and salt water. It is now possible to measure DO in either fresh or salf water with the same instrument. When meauring DO in salt water, it will automaticaly measure the salt concentration and make the salinity correction. It is also possible to set a freely selectable salinity correction factor of between 0 and 4 precent. 20 samples of data for all 6 parameters can be stored in memory to be recalled later for display and print out. Store the results of measurement of all six parameters for up to 20 samples. There is no need to record measured values on site. Data stored in memory can be recalled and displayed at any time, and can even be simuItaneously printed out on any standed printer by connecting it to the Centronics-specification printer output terminals. SENSOR ASSEMBLY Standard: sensor with 2 m cable. Optional: Sensor with 10 m or 30m cable. Probe includes 2 m cable. Note: Cable is not detachable. Use the multiparameter probe to monitor 10 different parameters, including total suspended solids, water depth, and ORP. Water quality instrumentation for simultaneously measuring up to 13 different parameters. Water quality sensors for permanent installation.